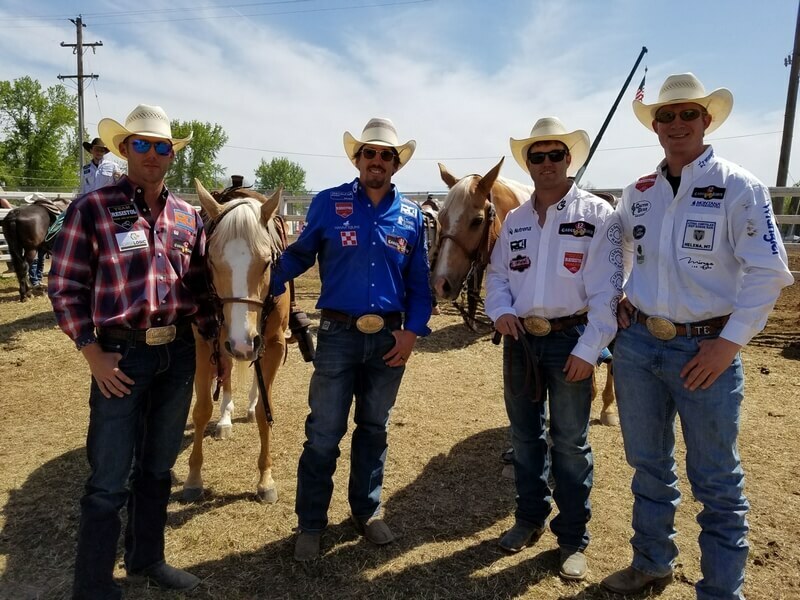 At the 2018 Red Bluff Round-Up, steer wrestlers Timmy Sparing, Helena, Mont., Tyler Pearson, Louisville, Miss., Tyler Waguespack, Gonzales, La., and Ty Erickson, Helena, Mont., pose with Waguespack’s horse, Outlaw (standing next to Waguespack.) Outlaw has carried the last four Red Bluff Round-Up steer wrestling champs to their wins. Red Bluff, Calif. – Outlaw is a special horse. He’s a true champion of the Red Bluff Round-Up. He didn’t win a buckle or cash for his work, but he carried the last four steer wrestling champions to their wins. Outlaw was the horse that Tyler Pearson rode when he won the steer wrestling at the Round-Up last year. Chance Howard rode Outlaw when he won it in 2017. In 2016, Ty Erickson rode him, and the year before that, Tyler Waguespack rode him. The 22 year-old palomino is owned by two-time world champion steer wrestler Tyler Waguespack, of Gonzales, Louisiana, who got him several years ago. A former barrel racing horse, Outlaw wasn’t a big fan of running barrels. “He was a run-off,” Waguespack said. “He wouldn’t turn the first barrel.” When Waguespack’s wife, Sarah Rose, a world-class barrel racer herself, exercised him, he tried to hit the barrels. So Waguespack and his dad tried him as a steer wrestling horse. One thing that’s necessary for both barrel racing and steer wrestling horses is they need to be able to run fast, and Outlaw could do that. The horse loved the steer wrestling and was good at it, so Waguespack switched him to a new event. It’s common for steer wrestlers to share horses as they rodeo across the nation. Sometimes a cowboy will fly to a rodeo, unable to take his own horse, so he borrows someone else’s, with the horse’s owner getting a cut of the rider’s winnings, if he wins. Outlaw was so good at his job that a lot of cowboys rode him, and usually made the pay window on him. Lots of cowboys have ridden Outlaw at a lot of rodeos. Earlier this year, Pearson, another world champion, won second place at the Ft. Worth, Texas rodeo on Outlaw. Outlaw has been ridden, and his rider has won money at Tucson, Ariz.; Springdale, Ark. ; Pecos, Texas, and more. “He’s won a ton of rodeos,” Waguespack said. Waguespack has brought him to California for four rodeos; Red Bluff, Salinas, Clovis, and Oakdale, and he’s carried the champion at each of those rodeos. At Clovis, he’s been the horse ridden by the champ two of the last four years. Waguespack has younger horses coming up that he’s working with, and he often rides Scooter, another exceptional steer wrestling horse, owned by Tyler Pearson and Kyle Irwin. But Outlaw is special. The 98th annual Red Bluff Round-Up is April 19-21 at the Tehama District Fairgrounds in Red Bluff. Tickets are on sale online at www.RedBluffRoundup.com.